It's fall, the time for maple seeds to come whirling down like helicopter rotors. Let's look at why and how these seeds do this — a perfect project for kids and adults. On the left are bigleaf maple (Acer macrophyllum) seeds, which grow in large bunches. On the right are vine maple (Acer circinatum) seeds, which may grow near each other but not in bunches. A single bigleaf maple seed is about 2"/5cm long. A vine maple seed is about half that size, at 1"/2.5cm long. Bigleaf maple seeds are attached together at an acute angle of 45° to 90°. Vine maple seeds are attached together at almost 180°. At the same time, you notice that maple seeds grow in pairs. Many other Pacific NW trees have winged seeds, but only maple seeds grow as winged pairs. Spoiler alert: If you want to experiment on your own, skip this section! Find a winged seed-pair from a maple and toss it up into the air. Does it spin down? No, it drops like a stone. But look closely at a brown, dried seed-pair. You will see a crack forming between the two seeds. While the seed-pair hangs in the tree, it continues to dry and the crack gets wider. Then, the two seeds break apart and twirl down singly as opposed to in pairs. 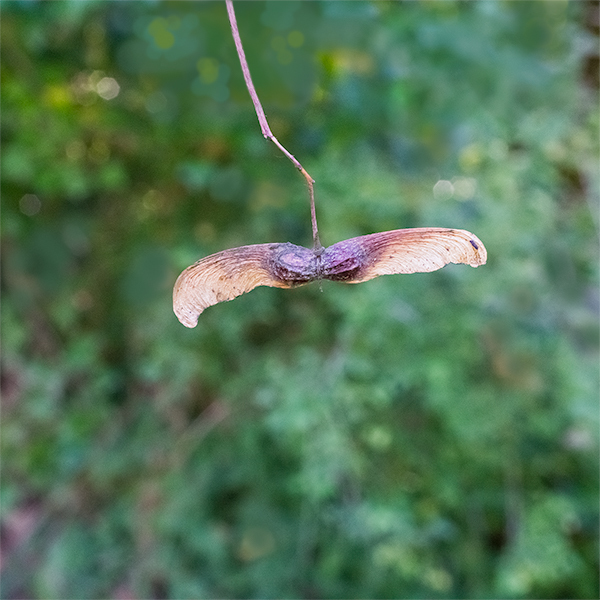 Find a single winged maple seed (or break one off of a pair) and toss it into the air. It spins rapidly like a helicopter rotor, slowing the seed's descent. Why is it advantageous for maple seeds to spin? Trees can't walk around on their own. If their seeds have no means of transport, they would germinate directly underneath the mother tree. The seedlings would compete with the mother tree and each other for sunlight, moisture, and other resources. In contrast, seeds that disperse help ensure that the species continues to propagate and survive. On a perfectly windless day, a maple seed would twirl straight down and land directly below where it started. But outside air is seldom completely still. Wind blows seeds around. The longer a seed can stay airborne, the greater the chance that it will blow farther from its parent, spreading the species and helping ensure survival. This is the advantage that maple seeds have. The whirling slows the seeds' descent, allowing more time for the wind to disperse them. Whirling maple seeds can travel many hundreds of yards/meters in the breeze. I sweep them off of my driveway and deck even though there is no maple tree overhead. Question: Aside from wind, what other ways do seeds get dispersed? Question: Plants existed for eons before there were animals. What do you think was the first mode of plant seed dispersal? How does spinning help maple seeds stay aloft? Each single winged seed has a bulge at one end that contains the seed kernel. The rest is a paper-thin wing. The wing has one hard edge that is reasonably straight or gently curved. The surface of the wing is covered with tiny irregular ridges. The wing spins rapidly around its center-of-gravity. The spinning creates a tornado-like vortex just behind and above the leading edge, which generates lift. (Lift is an upward force that partly counteracts gravity.) The lift slows the seed's descent. Scientists discovered this mechanism less than ten years ago. See D. Lentink et al., Leading-edge vortices elevate lift of autorotating plant seeds, Science 324:1438-1440 (Jun. 12, 2009). Coincidentally, this is the same mechanism that keeps hovering insects aloft. First, gather some dry maple seeds, either from trees or on the ground. (1) Toss a seed pair up into the air. What happens on its way down? (2) Toss a single winged seed up into the air. What happens on its way down? (3) Hold a seed so that the wing is pointing straight down, with the bulging kernel at the top. Drop it. What happens on its way down? (5) Advanced: Find a Boeing engineer. Ask her/him whether the tiny ridges that cover the surface of the seeds' wings have any role in the seeds' flight. (6) Advanced: Drop a number of single maple seeds, one after another. Try to determine whether maple seeds have a "handedness" — i.e., a tendency to spin clockwise or counter-clockwise. Newer PostWhy is Alaska yellow-cedar called "yellow?" Older PostWhy does this subalpine fir have no branches on one side?